This World Economics Association (WEA) volume - edited by Maria Alejandra Madi and Jack Reardon and supported throughout by Grazia Ietto-Gillies - originated with a successful WEA online conference (curriculumconference2013.worldeconomicsassociation.org). The volume has been conceived with current and future economics students in mind: they will be the economists of the future. 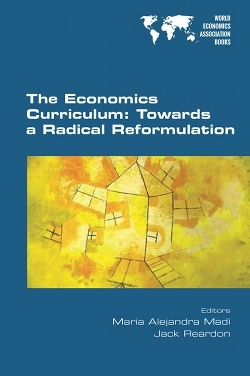 One of the main ideas underlining the book is that "being an economist" in the XXI century requires a radical change in the training of economists and such change requires a global effort. A new economics curriculum is needed in order to improve the understanding of the deep interactions between economics and the political forces and the historical processes of social change. The need for trans-disciplinary and interdisciplinary work is highlighted. Discussions include the following. Main critiques of current practices on theory, methods and structures. Current gaps in the economics curriculum. What should economics graduates know? The contributors are: Nicola Acocella, Sheila Dow, David Hemenway, Arturo Hermann, Grazia Ietto-Gillies, Maria Alejandra Madi, Lars P&aaring;lsson Syll, Constantine Passaris, Paul Ormerod, Jack Reardon, Alessando Roncaglia, Asad Zaman.